A compilation of absolutely boring lectures delivered by largely dull characters. A half-decent plot ain't good enough to make a gripping movie. After a drought of 3 weeks, will Black & white serve as a welcome relief or yet another one to maintain one arm's distance from? Let's just hope that not all characters see either black or white and they have shades of gray that people sitting in the audience can believe, if not identify with. It's going to be difficult to talk about a Subhash Ghai product without remembering the well-deserved early demise of his earlier products Yaadein and Kisna. Carrying that wariness in their minds, many in the audience are going to be skeptical of Black & White even if the man himself claims it to be "different". ... It is nothing short of an earth-shaking experience. Same can be said about of my experience while making such a realistic film - which confronted my psyche with new never-before nuances - be it the story, the characters, the conflict, the drama or the final resolution. It has left me emotionally elevated - a different kind of elevation from mainstream cinema. Moreover, Black & White threatens to be a lecture. 'BLACK AND WHITE' is an emotional Drama that entertains for sure but leaves the audience with a lofty message for all humanity - in search of harmony amidst diversity. 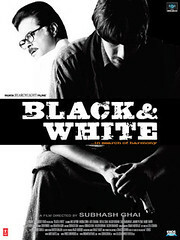 In that sense 'BLACK AND WHITE' is an idea whose time has come. Just what the world needs perhaps. Oh well, time will tell soon enough, what we have in store. Meanwhile, I am going to remind myself of the movies the movie that I grew up with - Karz, Vidhaata, Hero, Meri Jung, Karma, Ram Lakhan - Movies that certainly weren't art personified, but they entertained me then. I have grown and so must have a huge portion of the audience. Let's hope the maker of these films has too. Haven't we had an overdose of movies based on religious fanaticism and associated terrorism already? May be not...Okay, haven't we had more than our share of stories told in the same mundane fashion? I say enough already! First credit where it's due. The base story is not bad at all. It has its interesting plot-twists. The sub-plots sort-of flowed into each other too!! The other thing that I enjoyed was the music. Unfortunately, this list stops here. The battle is completely lost in the filling-in of the details. The characters cannot be called underdeveloped, but they are unbelievably one-dimensional. One character is just shot out of the plot just about when his character could have done something interesting. It is hard to digest when a character behaves the exact same way when he is being friendly with someone and when a close relative passes away. Even if he is the modern-day Gandhi. How can one be speechlessly grieving in shock in one moment and lecturing on tolerance in the other. Almost each character spieling out speech after speech on either tolerance or intolerance, doesn’t help either. Each lecture consists of the same old, mind-numbing lines. Each line being repeated begs us to be thankful if they are two different sentences saying the same thing. Because at other times, the same words are repeated - asking us to be sympathetic towards the dialogue writer for being creatively-challenged. And one character who certainly shouldn't have been encouraged was the "poet" grandfather figure. The lyrics were just inane, sir, let alone inspirational. Anil Kapoor certainly has a wider range of expressions than this. Anurag Sinha again, has a great voice but a very monotonous style of delivering dialogues. Shefali Chaya should be admired for trying her best to maintain composure while playing a rather loud character. I would still blame the character development for the lackluster performances. They had a very good reason to pick a tone and stick to it - the script has no variation in their character! A Jihadi (Anurag Sinha) is sent to India to blow up the Red Fort in Delhi on Independence day. Does he succeed? What he goes through? Watch if you must in Black and White. One slight fraction of a scene where time was spent in explaining the economics of fanaticism. The "Haay Allah" song hardly had any audible strings but the guy on screen was strumming away. Screen-time given to Gafar bhai (grandfather) was just way too much. It didn't add anything to the end product. Cuts of Anurag Sinha's still photographs that looked like they were clicked for the promos being inserted in the "main chala" song - very amateurish. i had sworn off Ghai after Kisna...should've stuck with that. i think he should either stick to his masala entertainers or quit. Anurag has a good screen presence but apart from a couple of outbursts all he had to do was stand still, hands folded. the only redeeming factor for me was Habib Tanvir. love his voice. Dude was it really an overdose? Give me a list of 10 such overdoses if you can! Sameer Panchangam has posted 3 comments and has rated 1 movies. See Sameer Panchangam's page for more details.